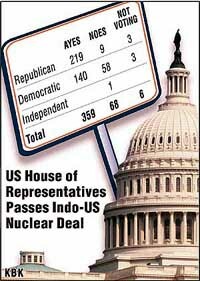 The House of Representatives on Wednesday night overwhelmingly approved the US-India civilian nuclear deal handing the Bush administration a significant victory on a key foreign policy issue. Lawmakers rejected amendments that the Indian government and Bush administration had said would imperil the delicately balanced agreement. Asserting that the goalposts will be there and not shifted, Prime Minister Manmohan Singh told the Rajya Sabha today that if the end product of the American legislation was inconsistent with the July 18, 2005, agreement on the Indo-US nuclear deal then that would be determining factor on what India would do. Just six months before the Assembly elections, the Punjab Chief Minister, Capt Amarinder Singh, today ordered a major reshuffle of the portfolios of his Council of Ministers obviously to tone up the functioning of his government. The minimum support price for paddy for the Kharif 2006-07 has been fixed at Rs 580, a marginal hike of Rs 10, by the Cabinet Committee of Economic Affairs. The meeting presided over by Prime Minister Manmohan Singh decided to fix the Grade “A” variety paddy at Rs 610, a notional hike of Rs 10. The controversial Office of Profit Bill, which was returned by President A.P.J. Abdul Kalam for reconsideration was passed today by the Rajya Sabha by division vote, following a heated debate in which the BJP described the re-introduction of the Bill as the “arrogance” of parliamentary majority. The Indian Institute of Management, Bangalore, today made it clear that it would be unable to implement the reservation policy this year even if it was directed to do so by the Union Human Resource Development Ministry. Even as Prime Minister Manmohan Singh was chairing a Union Cabinet meeting at his 7 Race Course Road residence here today, three youngsters in a black Sonata car breached the high security cordon and drove right up to the gate from where Union Ministers are allowed entry. However, to play down the event, PMO spokesperson Sanjay Baru said: “There was no security breach. Pakistan has banned the transmission of Indian TV channels, the Rajya Sabha was informed today. Information and Broadcasting Minister P R Dasmunshi said in a written reply the ban was being enforced strictly on Indian news channels in particular.